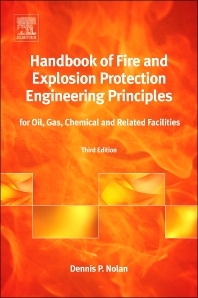 Written by an engineer for engineers, this book is both training manual and on-going reference, bringing together all the different facets of the complex processes that must be in place to minimize the risk to people, plant and the environment from fires, explosions, vapour releases and oil spills. Fully compliant with international regulatory requirements, relatively compact but comprehensive in its coverage, engineers, safety professionals and concerned company management will buy this book to capitalize on the author’s life-long expertise. This is the only book focusing specifically on oil and gas and related chemical facilities. This new edition includes updates on management practices, lessons learned from recent incidents, and new material on chemical processes, hazards and risk reviews (e.g. CHAZOP). Latest technology on fireproofing, fire and gas detection systems and applications is also covered. An introductory chapter on the philosophy of protection principles along with fundamental background material on the properties of the chemicals concerned and their behaviours under industrial conditions, combined with a detailed section on modern risk analysis techniques makes this book essential reading for students and professionals following Industrial Safety, Chemical Process Safety and Fire Protection Engineering courses. Dr. Dennis P. Nolan has had a long career devoted to risk engineering, fire protection engineering, loss prevention engineering and systems safety engineering. He holds a Doctor of Philosophy degree in Business Administration from Berne University, Master of Science degree in Systems Management from Florida Institute of Technology and a Bachelor of Science Degree in Fire Protection Engineering from the University of Maryland. He is a U.S. registered professional engineer in fire protection engineering in the state of California.He is currently on the Executive Management staff of Saudi Aramco, located in Dhahran, Saudi Arabia, as a Loss Prevention Consultant/Chief Fire Prevention Engineer. He covers some of the largest oil and gas facilities in the world. As part of his career, he has examined oil production, refining, and marketing facilities under severe conditions and in various unique worldwide locations, including Africa, Asia, Europe, the Middle East, Russia, and North and South America. His activity in the aerospace field has included engineering support for the NASA Space Shuttle launch facilities at Kennedy Space Center (and for those undertaken at Vandenburg Air Force Base, California) and “classified” national defense systems. Dr. Nolan has received numerous safety awards and is a member of the American Society of Safety Engineers, He is the author of many technical papers and professional articles in various international fire safety publications. He has written at least four books, several published by Elsevier.